The name Long-Lewis™ dates back to 1889 and first appeared on a hardware store in Bessemer, Alabama. In 1915 Henry Ford began granting Ford franchises to dealers with one of the first being granted to the Long-Lewis™ Hardware Company. Its owner, William J. 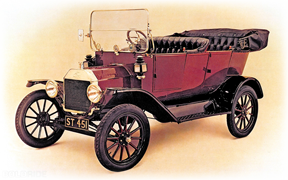 Long, had become interested in the “horseless carriages” about four years earlier when he purchased his first Model T from a man who won the car in a raffle. Although a train destroyed Mr. Long’s Ford after it stalled on a railroad track, he was still convinced that the “automobile” was the vehicle of the future. Fords were shipped to Long-Lewis™ in boxcars and the train stopped in Birmingham to unload the new automobiles. The wheels were put on at the railhead, and they were then driven to the hardware store in Bessemer. In 1921, a two-story addition was added to the hardware building to house the Ford Division of Long-Lewis Hardware. In 1929, a second hardware store was opened in downtown Birmingham. Then in 1965, the Ford Division moved from the hardware store in downtown Bessemer to a separate location on the Bessemer Super Highway. In 1982, the Bessemer site of Long-Lewis™ Hardware closed for good. Vaughn Burrell, the long-time General Manager bought out William Long in 1986 to become the sole owner of Long-Lewis™ Ford in Bessemer and Long-Lewis™ Hardware in Birmingham. In 1999, Mr. Burrell moved Long-Lewis™ Ford from Bessemer to its new facility in Hoover, Alabama. In September of 1996, Vaughn Burrell agreed to a partnership with, long-time, valued employee, Todd Ouellette in Muscle Shoals, Alabama. After a 5-year successful partnership, Todd bought out Mr. Burrell and is the current Owner and President of the Long-Lewis™ Auto Group, Long-Lewis™ Ford Lincoln of the Shoals as well as Long-Lewis™ Mitsubishi of Florence and Long-Lewis™ Volkswagen of Florence. In August of 2014, Todd bought out Gilmore Ford in Prattville, Alabama, and renamed it Long-Lewis™ of the River Region. In January of 2016 Todd opened Long-Lewis™ Mitsubishi Montgomery. The Long-Lewis™ organization currently retails over 800 vehicles a month and delivers another 600 plus units each month to the fleet and wholesale markets. According to a recent National Automobile Dealers Association (NADA) Annual Contribution of Alabama’s Vehicle Dealerships Report, the Long-Lewis™ organizations annual sales volume is 11 times larger than that of the average dealership making us by far the largest automotive retailer in Alabama. The Long-Lewis™ name has a very rich history of customer and employee satisfaction that focuses on creating a work environment that promotes employee longevity, and one that strives for complete customer satisfaction. Our honesty, integrity and no nonsense way of doing business has led to us being awarded more Presidents’ Awards for customer satisfaction than any other dealer in the Nation. In fact, Long-Lewis™ was recently recognized as the #1 Dealership in the Nation in Customer Satisfaction by FMC. This was a huge accomplishment and one in which we take much pride. According to a recent National Automobile Dealers Association (NADA) Dealership Workforce Study Industry Report, the National average automotive sales staff turnover rate is 62%. Long-Lewis™ is less than 10% making the average tenure over 6 times the National average. Not surprising since Long-Lewis™ has been recognized as being one of the ‘Top 100 Best Dealerships’ to work for in the Nation by Automotive News multiple times. Long-Lewis™ also firmly believes in giving back to the community and to those less fortunate. There are numerous activities throughout each year that are sponsored by the company geared towards doing just that, most all of which are made possible by tremendous employee support. In addition in 2013, the Ouellette family formed The Long-Lewis Foundation, a privately funded foundation setup to support local evangelical causes and to help people in the communities we serve with medical and emotional needs. Our success stems from listening to the wants and needs of our customers as well as a combination of great employees, strong community involvement and our unconventional Customer Centered Buying Process. We are committed to staying the course and living out the core values that drive our decisions and define who we are today as we continue the Long-Lewis™ tradition. If you haven’t already, please come see how we are different, and why we are the largest and oldest automotive retailer in the State. You will see and feel the difference as soon as you walk in our door. You are always welcome, and we sincerely appreciate to opportunity to earn your trust, business and support. That’s How You’ll Be Treated Every Visit.